Asos is calling time on its local China operation after an unsuccessful launch in a market that many British retailers are rushing to cash in on. The retailer has revealed closing the China operation will cost the business £10m. 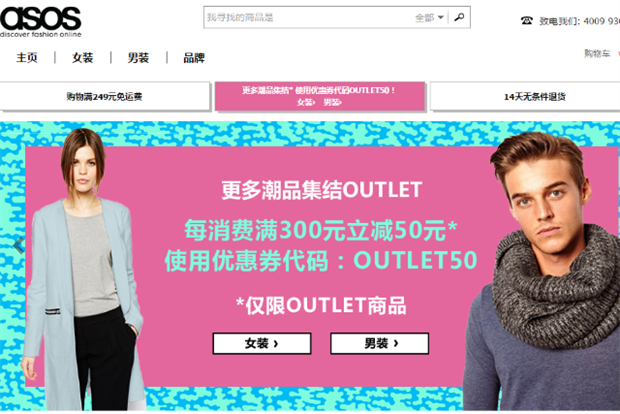 Asos chief executive Nick Beighton said the retailer will continue to do business in China through its Asos.com website. He added: "We are simply serving our growing customer base there in a more efficient, less costly manner." Chinese consumers will now be able to order the full 80,000-strong product range from Asos.com, but will no longer benefit from having a local Chinese business that offered a range of 6,000 products. Asos admitted at the end of 2014 that it had taken on "too much too soon" with its launch in China. Chairman Brian McBride told Marketing: "In the grand scheme of things, China is a tiny, tiny fraction of our total turnover. But it did require a lot of management attention, time and a disproportionate amount of investment, so that’s why it did have an impact on the bottom line but not at the top. "We probably overinvested in China, we ran at it too quickly and there were lots of great learnings but we took on too much too soon. His comments followed on from a turbulent year that involved three profit warnings due to the sterling’s strength against other currencies, warehousing issues and the launch of the business in China in 2013. McBride also admitted to cultural errors such as trying to offer one seasonal range in a country which has multiple climates in different regions, while founder and former chief executive Nick Robertson has also previously highlighted issues such as meeting Chinese rules on the clothing trade. Asos closing its Chinese operations comes as British retailers seek to exploit the huge Chinese market, which is being bolstered by a growing middle class. A number of retailers are selling through Alibaba in order to navigate the complex Chinese market. In September Sainsbury’s began trialling selling products on Alibaba’s Tmall website five years after exploring an entry into the country in 2010 before shelving plans. Marks & Spencer has sold in China for a number of years through Alibaba and exploited the Chinese shopping phenomenon Singles Day, which generates more sales than Black Friday. Chinese businesses are also seeking to acquire British retailers. House of Fraser is due to launch stores in China after being bought by China’s Sanpower Group.